Sexual abuse appears to be all too common in the message. We are aware of a number of cases that happened in message churches, that were brought to the attention of the pastor and nothing was done. But what was William Branham's position on sexual abuse, particularly that of minors? 3 What did William Branham see? William Branham in Jeffersonville with Paulaseer Lowrie. The trailers in the background went on to The Park in Prescott, and Paulaseer Lowrie went back to India and started a cult-city near Tirunelveli, India that was founded on the premise that the rapture would happen in 1977. In the summer of 1962, about sixty members of several large extended families moved across country seeking a place away from the world to wait for the rapture. They were driven by William Branham's comments that Rapture was at hand. They settled in the Pine Lawn Trailer Park (the "Park") in Prescott, Arizona. They were lead by William Branham's "tape boys", Leo Mercerand Gene Goad, who had been close friends since college. Leo's mother was associated with the School of the Prophets, which may have led to Leo's interest in William Branham. 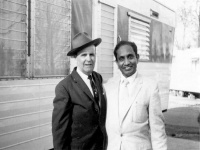 Leo and Gene quickly became close and trusted confidants of William Branham, managing all appointments and preaching schedules, correspondence, tape making and sales, and finances. You couldn't see William Branham without going through them. William Branham directed this on tape, saying that those boys will never tell you anything that will hurt you. Some of the elder followers were aware of the homosexual past between Leo and Gene but it was understood that they had repented of this, and William Branham advised them to find wives (which was not uncommon advice in the 1960's). He played a role in the selection of their wives. William Branham visited the Park on several occasions and Leo actually wrote the Hebrews book. Leo's wife typed it. William Branham approved it and put his name on it. By 1963, Leo was dissatisfied with his salary, and began diverting some of the donations to himself. There was a falling out, and Leo gathered his followers to benefit from the special, personal teaching William Branham had given him. Ed Daulton asked William Branham about the planned move and he said at first that he shouldn't go. Later he changed his mind and said that they should go - "I see it come out alright in the end." Leo took steps to limit the influence of the family elders, and appointed young men in their 20s and 30s as his lieutenants. Duties included beating lines of children, and beating men he felt were out of line. Beatings could be administered with a belt, electrical cords, or fists. Sometimes young offenders were circled by taunting men and made to fight it out. Women were not usually physically punished, but might be slapped or isolated. William Branham continued to support the group with extended hunting trips to Spider Ranch. He preached two sermons - "The Odd Ball" and "Leadership" at the Park. The group always had a phone hookup to his major sermons. Leo and Gene kept all of the original master tapes they made during their tenure. They told people that there were things on their tapes that were not on any others. Leo found a source of medical drugs through a local doctor, who thought he was prescribing drugs for the whole group. Leo received daily pain injections and large quantities of Percocet and other pills. As a result of the drugs, his control of the group weakened in the period between 1970 and 1974, ultimately leading to the Park group's breakup in 1974. Leo died in Prescott several years later of abdominal cancer. Gene and his wife, Connie, had several more children after the group broke up. They eventually separated and Gene ended up living in a cave. He died of a self-inflicted gunshot wound in the mid-1980's. Marietta Loker and her husband, Roger, lived in the Park. We understand, from a reliable source, that Gene and Leo used to take Marietta's husband and beat him so badly that his whole body would be covered with bruises. When William Branham came by, Marietta spoke with him and asked him if her family should leave the "Park" because she was afraid for her boys. William Branham apparently counseled her, "Stay here. Everything will be OK."
Unfortunately, everything was not "OK". Marrietta's son, Keith, was horribly abused and this took a terrible toll on him. Loker was convicted of two murders, committed during the course of the robbery of adult bookstore in Fontana [California]. The undisputed evidence was that Loker entered the store and began firing a handgun, striking four people. He stole two of the victims’ wallets, and forced an employee to give him money from a cash register. Two of the victims later died from their wounds. Loker fled to Arizona, driving a car he had stolen from an Arcadia store owner at gunpoint the day before. The day after the Fontana robbery-murders, Loker robbed a convenience store in Flagstaff, Arizona, shot one man and raped his wife. He was arrested three days later. At trial, he conceded responsibility and San Bernardino Superior Court Judge Clay M. Smith permitted the prosecutor to repeatedly refer to a psychological report concerning Loker, purporting to identify the document and characterizing its contents even though the report was not in evidence and no witness ever identified the report or laid a foundation for its admission. Writing for the unanimous Supreme Court, Justice Carol Corrigan ...concluded that based on Loker’s “brutal and terrifying crime spree,” Loker’s sentence was not disproportionate to his crimes, despite Loker’s mitigating evidence focused on his upbringing in a religious cult, immaturity, emotional problems, lack of prior criminal behavior, dysfunctional family background, and remorse for his crimes. The cases are People v. Wilson, 08 S.O.S. 4471 and People v. Loker, 08 S.O.S. 4497. "Leo Mercer, a self-proclaimed minister, ran the park. After Brother Branham’s death in 1965, Mercer gradually became more authoritative, employing various forms of punishment. He would ostracize people from the community and separate families. Children were beaten for minor infractions like talking during a march or not tying their shoes. Mercer would punish girls by cutting their hair, and force boys to wear girls’ clothing. There was also evidence that Mercer sexually abused children." In one instance, "...Mercer ordered that [a girl's] hair be cut off to punish her because he had had a vision from God that she was being sexually inappropriate with young children. [She] was beaten and forced to wear masculine clothes that covered much of her body, hiding her bruises. Her fingertips were burned so she would know what hell felt like." What did William Branham see? From a sermon titled "Godhead" preached by Lee Vayle on July 2, 2000"
"At the same time Leo and Gene, two homosexuals, attached themselves to Bro. Branham's ministry, tape boys, which was allowed by God, and when they absolutely showed what they were, God warned Bro. Branham what would happen to them. And I saw the vision in the vision book. "Leave them alone. They will leave and go into false doctrine." Now watch: doctrine. People hate the thought of doctrine. They don't want me to teach doctrine. They despise it. "They will leave and go into false doctrine and destroy themselves." That's in the vision book. And they did it." Obviously, William Branham didn't see the real important things relating to the Park. This page was last edited on 28 August 2015, at 00:24.